With 4 tilting wheels, Qooder offers an incredibly new and different driving experience. It combines the stability of a car with the thrill of a motor bike. It seems that the scooter industry cannot quite decide how many wheels they need. For decades, scooters have had two wheels. Then some manufacturers added an extra wheel at the front. As years passed by, these three-wheelers grew another wheel, only this time at the rear. This evolution process gave birth to the now known Qooder scooter – the brainchild of Lucio Marabese, project designer at a Swiss company called Quadro. 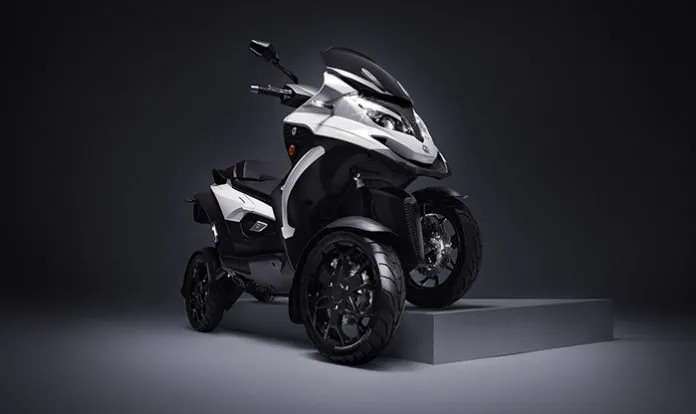 Qooder is the latest in a line of tilting 3- and 4-wheelers designed by Lucio, the early ones being the Yamaha Tesseract and Piaggio MP3. Why would anyone need a scooter with four wheels? Well, grip, lots of grip. On the tarmac roads, the four wheels provide you with twice as much adhesion. With other four-wheeled scooters, it is almost impossible to lean over, making it hard to corner at high speeds. The Swiss-designed Qooder has built-in hydraulic tilt system (HTS) that allows all four wheels to make the tilt at the same time. As you bounce over speeding bumps, lean into bends, or rush over potholes, each wheel remains gripped on the road. You can even ride down sideways on a flight of steps and remain comfortable on the scooter. If you have ridden a bike at speed, you will know that at times you can lean over so far into sharp corners you end up grazing your knee. The interesting thing about the Qooder is that you can tilt it even at very low speeds. It can lean up to 45 degrees at crawling speeds. You will probably fall off it before it falls over. It can take a while to get used to the scooter. At times people tend to forget to lean and turn at the same time, but with a test drive and practice, you will get the hang of it. The Qooder features a dynamic, centrally placed 400cc engine with 32.5 HP and integrated differential. With its hornet-like design, the Qooder resembles a jet ski that is made for the road. Its sturdy body and large seat make your ride comfortable. The flat platform and step-through frame gives you an easy hop on. You no longer have to worry about damaging your clothes; you can ride it in your office skirt or that power suit and even heels. The scooter also has a handy locker on the back for your helmet. The Qooder comes in Raw Black, Titanium Grey, Swiss Red and White colors. As of this writing, you can get the Qooder for 10,990 Euros, which includes VAT but excludes delivery, roadside, registration. How much are they and where can I get one ? super j’adore le concept, petite question ou plutôt précision, pas besoins de permit moto pour ce genre de véhicule il me semble ? How & where do I get one? What is the cast of Qooder n when is the launch. Looks like I could use one or two.. I need this….. How much…. Acabo de ver la Qooder y me parece increíble. Cuando llegaría a Latinoamerica en especial al Perú? Where is a dealer for this awesome bike ? I would like to get one of this bike..pls give me more information about this bite and were to buy it. I may need to purchase 2 of these. Where do I go to purchase? Like everyone els is asking. What is the price and where can I get some more info on a dealer. I hope it will arrive in malaysia.